The Kramdens and Nortons, now on stage until October 29! 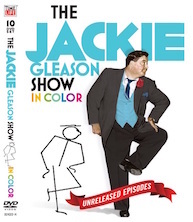 From the Sun and Fun Capital of the World, Miami Beach comes The Jackie Gleason Show in color! Never before released episodes, including seven Honeymooners sketches not seen in 50 years. Click here to learn more about Music Scholarships. ©Jackie Gleason Enterprises, LLC. All rights reserved. Site design and programming by LI Web Guy Inc.